The E. A. 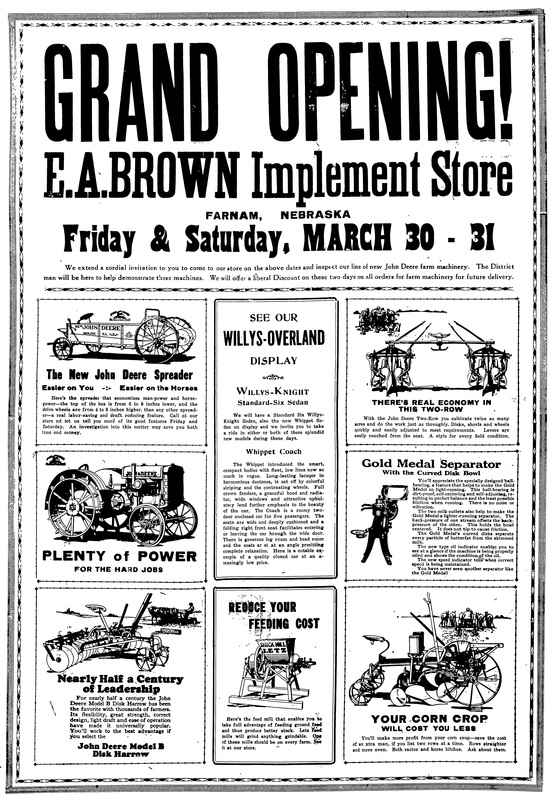 Brown Implement Store will hold their official Spring Opening of their Farnam branch on Friday and Saturday of this week, Mar. 30 and 31. These two days will be in the form of a get-acquainted and demonstration. The District representative of the John Deere Implement Co. will be here on these two days to help explain and tell you about the new features of this line of machinery. It is not necessary to take time and space to tell you about the John Deere line, for every farmer who has used one of these machines will tell you that they are among the best on the market today. Mr. Brown has unloaded several cars of new machines at the local branch since the first of the year and they are prepared to make deliveries promptly from either the Farnam or Curtis stores. As a special inducement to you to come to their store this week-end, they are offering a liberal discount on sales made during these two days, for future deliveries from either store. If you are going to need some new machinery this spring it will pay you to come to Farnam Friday or Saturday. The Browns are also distributors for the Willys-Knight and Whippet cars and will have them on display and invite you to take a ride in them while here. We wish to call your attention to their large ad on another page in this issue, read it.